After the huge success of Perludi’s innovative AMBERintheSKY loft and bunk bed, the company has launched a sister design called FLORAintheSKY. The design of AMBER and FLORA are similar in that they’re both modern, eco-friendly and kid-inviting, but FLORA features a new twist — colorful ropes tie FLORA’s corners together! 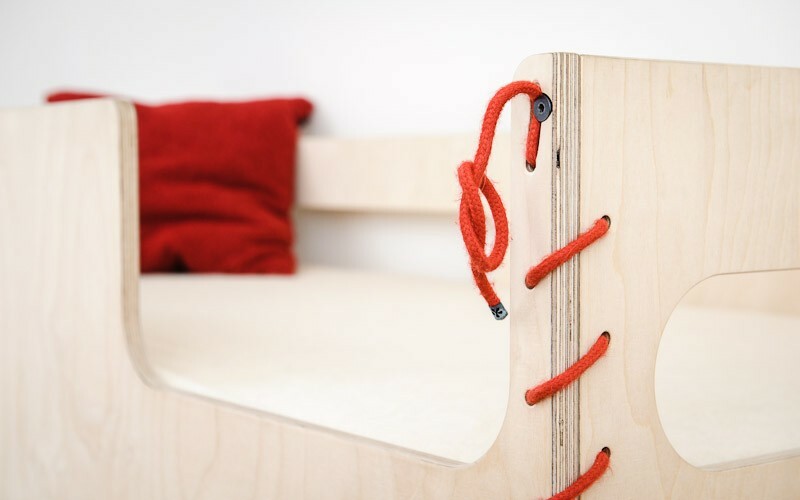 Designed by Thomas Maitz, FLORA can be used as a loft bed with an integrated playing area or as a classic bunk bed for siblings or as a place for friends to stay over. Cleverly integrated ladders on both sides of the loft bed means that you can situate FLORA just about anywhere in your child’s bedroom without cutting off upper loft access. This exclusive and innovative bed for children and adolescents is characterized by modern, stylish design including the colorful ropes in red, white or blue, that hold the structure together at the corners. Perludi made the bed this way in order to encourage kids to help their parents assemble the bed. If having a loft or bunk bed loses its allure, the upper part of FLORA can also be set up as a single bed at a “normal” level with just a few different ties. Like other Perludi furniture, FLORA is made with sustainable materials, including birch plywood, environmentally friendly glue for bonding and all lacquered Perludi furniture pieces are painted with saliva-resistant and environmentally friendly lacquers. Furthermore, Perludi is a “cradle2cradle” company, meaning all materials are fully recyclable. Perludi recommends that children under the age of 5 only sleep in the lower sleeping area of this bed. Because FLORA is made of natural wood, simply use a wet cloth to clean the bed. After the huge success of Perludi's innovative AMBERintheSKY loft and bunk bed, the company has launched a sister design called FLORAintheSKY. The design of AMBER and FLORA are similar in that they're both modern, eco-friendly and kid-inviting, but FLORA features a new twist -- colorful ropes tie FLORA's corners together! 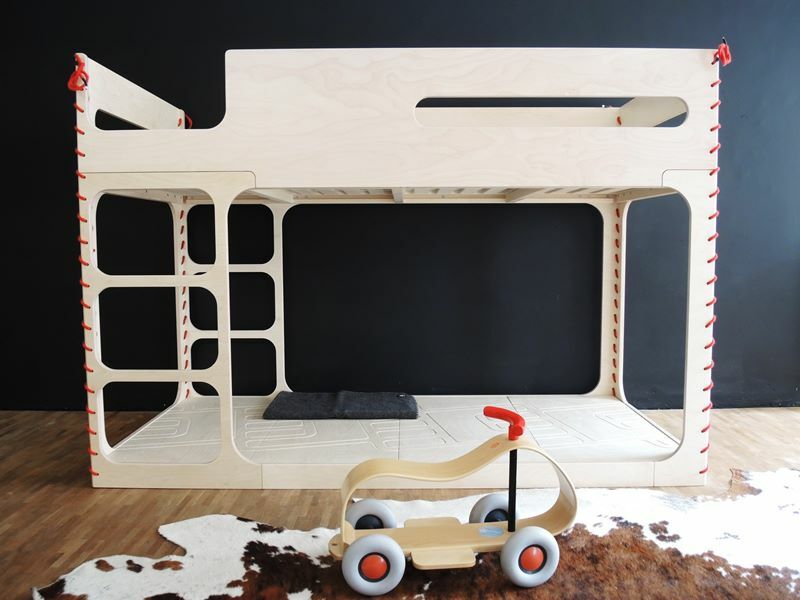 Designed by Thomas Maitz, FLORA can be used as a loft bed with an integrated playing area or as a classic bunk bed for siblings or as a place for friends to stay over. Cleverly integrated ladders on both sides of the loft bed means that you can situate FLORA just about anywhere in your child's bedroom without cutting off upper loft access.